Albuquerque, NM: REELZ today announced that the 2018 National Christmas Tree Lighting continues a tradition that began in 1923 and this year’s ceremony will air Sunday, December 2 at 10pm ET/ 7pm PT on Ovation and REELZ. Antonio Sabàto Jr. will host the 96th annual National Christmas Tree Lighting with several musical acts performing lovely musical renditions of classic holiday tunes from the 1920s through today. 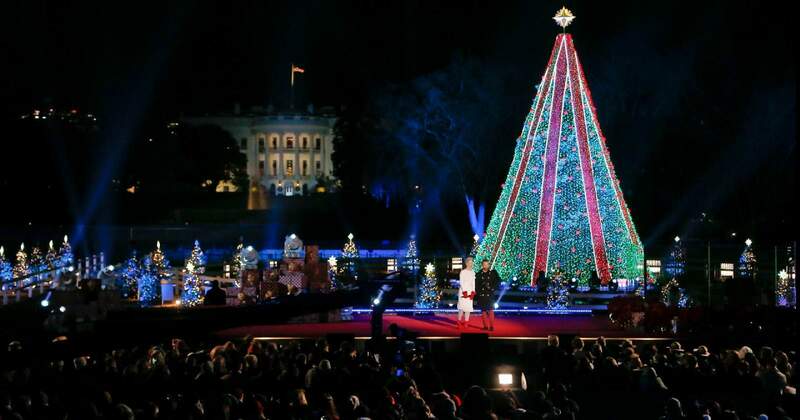 President Donald J. Trump and First Lady Melania Trump accompanied by members of the first family will help celebrate the 2018 holiday season by lighting the tree at the 96th annual National Christmas Tree Lighting Ceremony at President’s Park. First celebrated in 1923 by President Calvin Coolidge, the ceremony today inspires visitors and viewers from around the globe to #FindYourPark/#EncuentraTuParque during the holiday season. The National Christmas Tree is a living Colorado blue spruce from Virginia, which can be seen year-round in President’s Park. Thanks to a partnership with the National Park Foundation, GE Lighting is celebrating its 56th year of decorating the National Christmas Tree. Fifty-six smaller trees surrounding the National Christmas Tree will feature one-of-a-kind ornaments, representing every U.S. state, territory and the District of Columbia. REELZ is a leading independent cable and satellite general entertainment network that is home to factual entertainment, television events, miniseries, movies and series featuring big stories and big stars. Programming ranges from the critically acclaimed and award-winning miniseries The Kennedys to Autopsy: The Last Hours Of…, Scandal Made Me Famous, Behind Closed Doors, Geraldo Rivera’s Murder In The Family and much more that connects directly to the world of entertainment. REELZ also provides specific on-air recommendations for movies viewers can watch at home. REELZ is available in 70 million homes on DIRECTV channel 238, DISH Network channel 299, Verizon FiOS TV channel 692HD, AT&T U-verse channels 799/1799HD and cable systems nationwide. Find REELZ in your area by visiting www.reelz.com. Members of the press can find host and performer bios and photos at thenationaltree.org. For hi-resolution pictures of the 2018 National Christmas Tree Lighting ceremony please visit the REELZ press site at www.reelz.com/press in the Shows and Specials page.